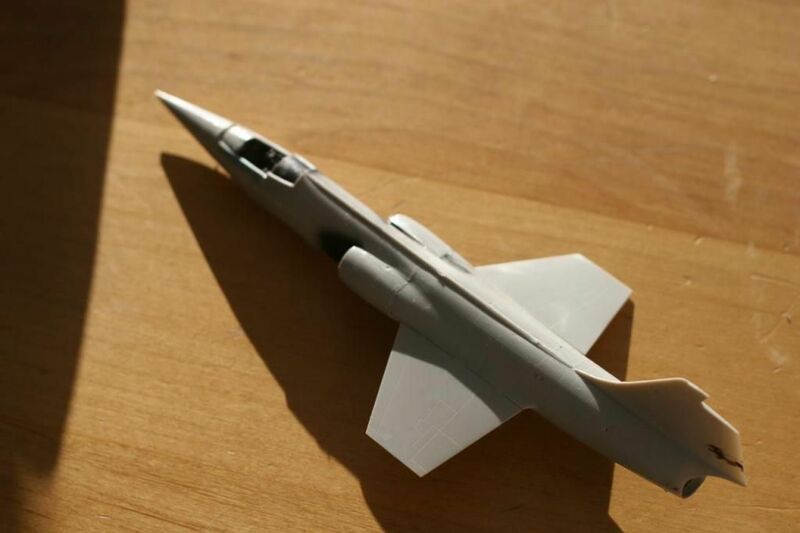 This is actually going to be a christmas gift for a former Starfighter Pilot friend of mine. 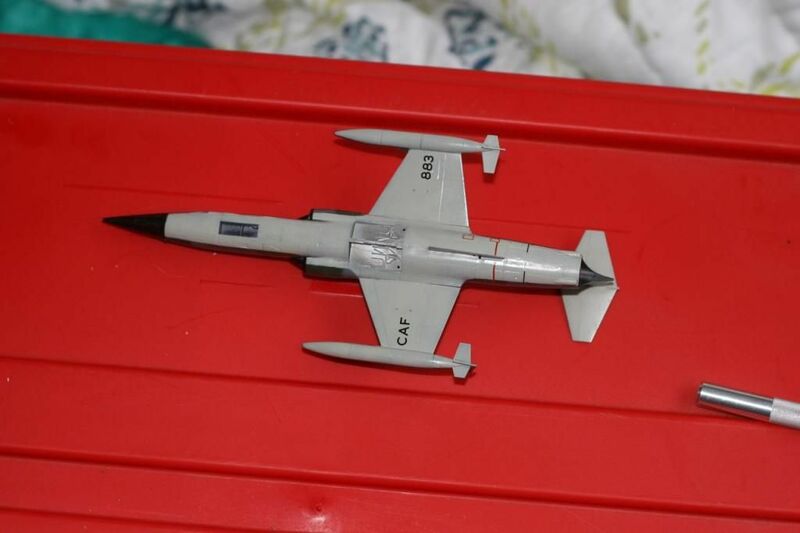 Alf knows him, but I won't put his name up for privacy reasons... but I built a CF-18 For him last christmas. This is going to be a pretty quick build... I think it will only be three or four posts. 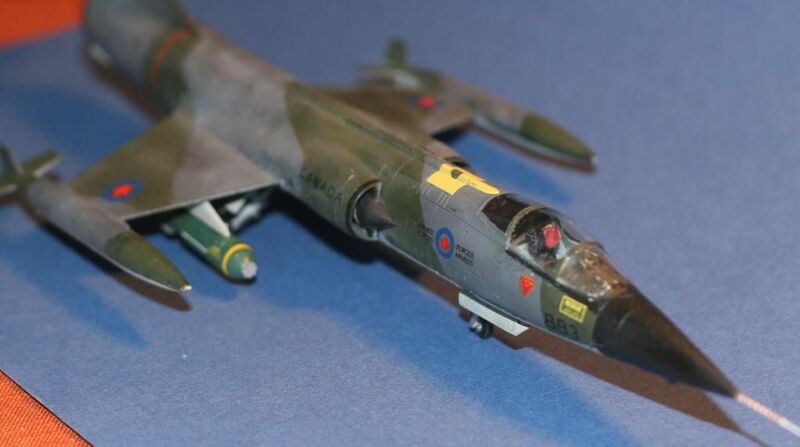 His aircraft is from 441 Squadron. The big issue is getting the centre fuselage around the intakes all lined up correctly. 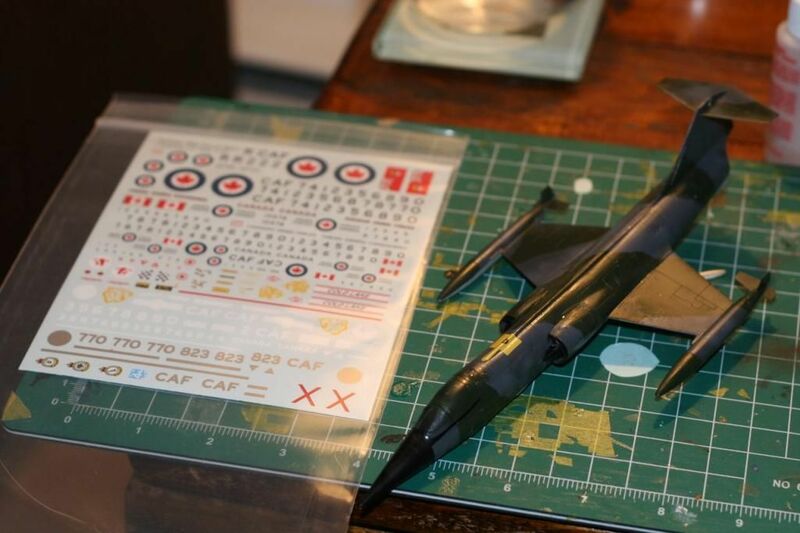 I was warned by some of you before, so I basically did a quick build of this 410 Squadron bird to identify any potential issues. 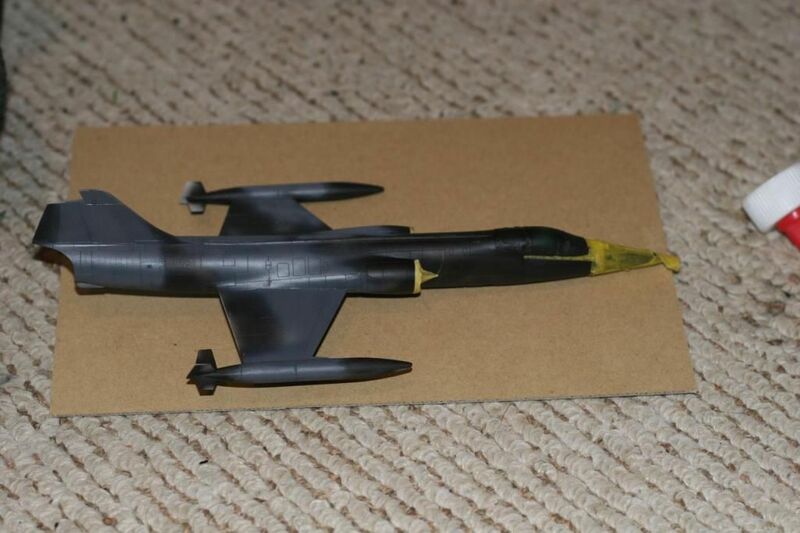 Looking at it on my desk, its bothered me a bit that I think the fuselage is perhaps bent by like 1 or 2 degrees at that seam. Its perceptible... but only just. 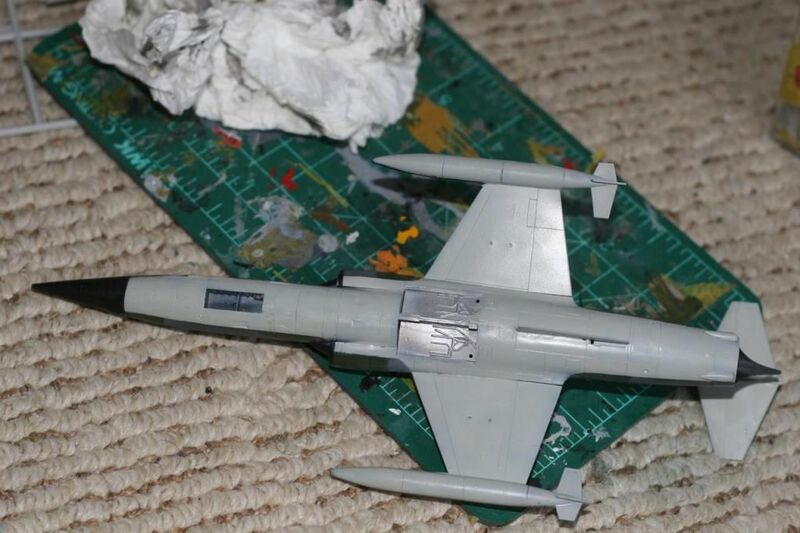 As I said, pretty good... just needed a bit of weathering and the seat. I don't have my macro lens set up yet, so I can't get better detail photos. IT looks a little blurry, but I think in position it does the trick. 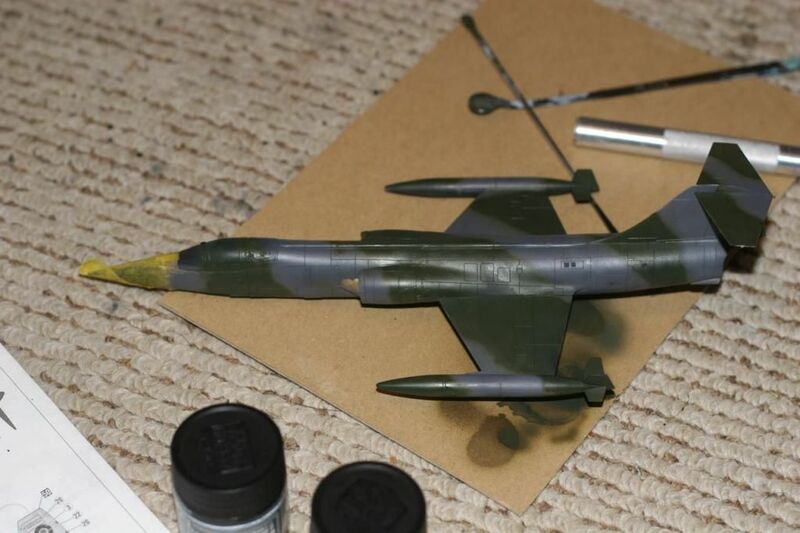 Next is marrying up the fuselage... the trickiest part. This is where I differed from the instructions. 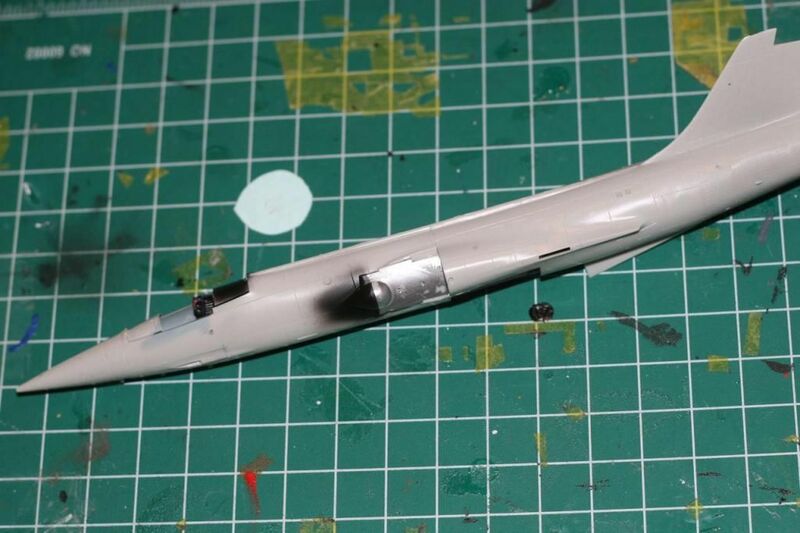 They call for the intakes to be added before you glue the front and rear halves of the fuselage together. That actually was the cause in my mind of a lot of the troubles with getting them flush. So I let them off and glued the front and rear halves together first. It actually worked pretty well.... because it also allowed me to get the halves puttied correctly, which could be easily described as well. So then I added the wings.... looks pretty good IMO. So then I primed it with Gunze's MR Surfacer finishing primer. ITs great, because its black so it can show any imperfections and serve as a pre-shading base too. 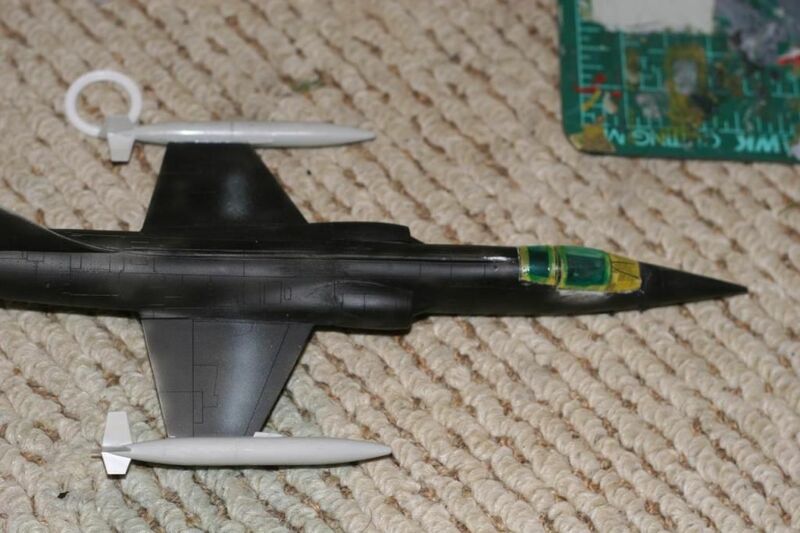 So I found some more problem areas around the main seam line between the two fuselage halves that required more sanding to get it nice and smooth. 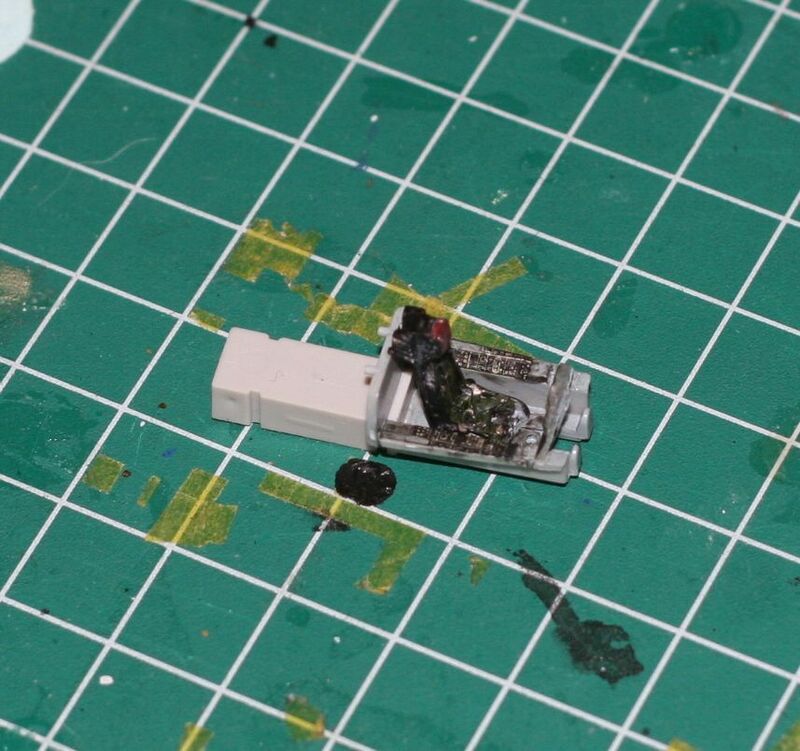 I also masked off the canopy and filled in a small gap between the centre and rear piece with some white glue. And finally did some with the green. So there I am... I'm going to have to fix some overspray issues and give the paint demarcation a bit more of an edge. Then I'll do the bottom, and add some details. 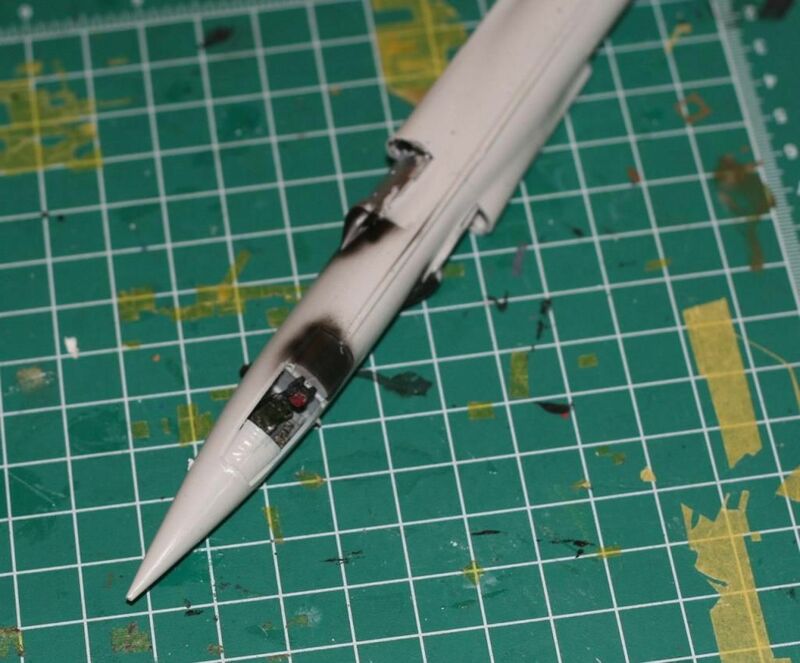 You're putting in a good effort on the fuselage seam - definitely a drawback to this kit. It's hard to tell from the pics, but it looks like the seat is black? It should be a medium grey colour, like the rest of the cockpit. You are rivaling the Phantom for speed of building. Good to see you on board with this GB; it was thanks to your generosity that I have some 1/48 Starfighters to build! Poopy... well, that's not good. I'll have to pop it out later and re-paint it. Not a big update... finished painting a few days ago, gloss coated it last night and then I did a bit of Decalling. And here it is with the belcher bits decals I'm going to use. I looked at this youtube video of 441 during this time and it doesn't have a mark. I don't know, Neu... but that aircraft was not assigned to a squadron, it belonged to AETE in Cold Lake. Here is a pic of the same one I found, in the variegated scheme, with no red mark evident. Looks like it must have been some kind of temporary marking. 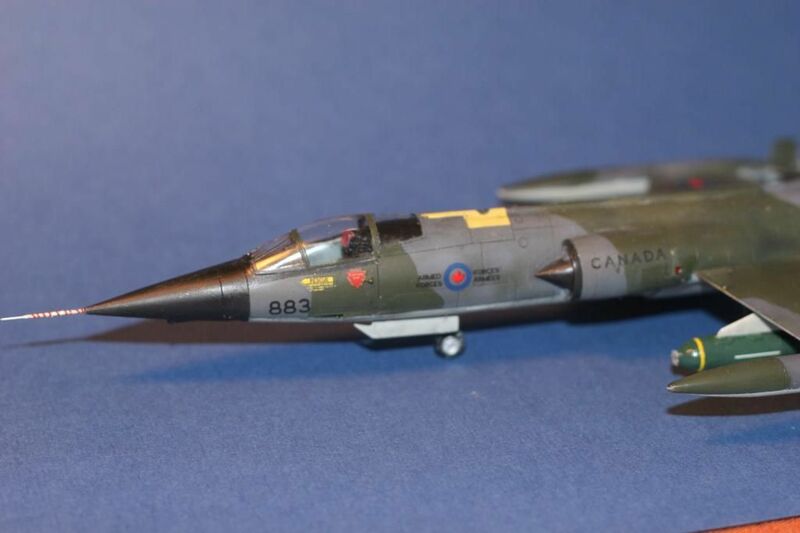 The interesting thing about this aircraft was it was the only CF-104 to be fitted with formation lights. You can make out where the emplacement of the light on the left forward fuselage is now a blanking plate in the picture below. 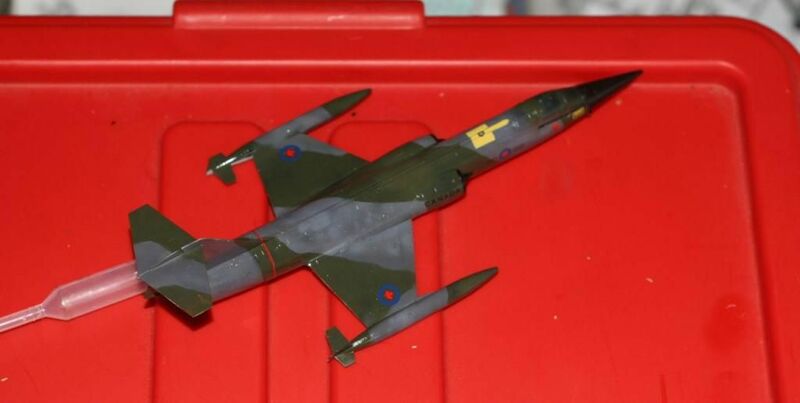 When it wore the formation lights, it was in the natural metal scheme, and was painted camo afterwards of course. It's probably a 417 sqn crest, as the aircraft isn't equipped with the RAWR gear. They weren't on 417 machines. 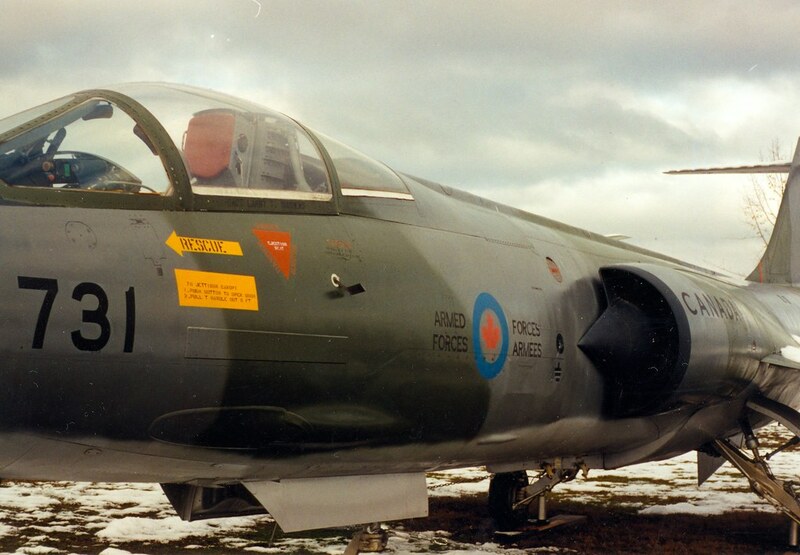 EDIT; I have a pic in the 417 Sqn book of 104731 in Cold Lake with 417 sqn. That pic was taken outside in Comox at the museum airpark. Well after retirement. The red marking is definitely a 417 crest. 104731 spent it's entire life at CFB Cold Lake. 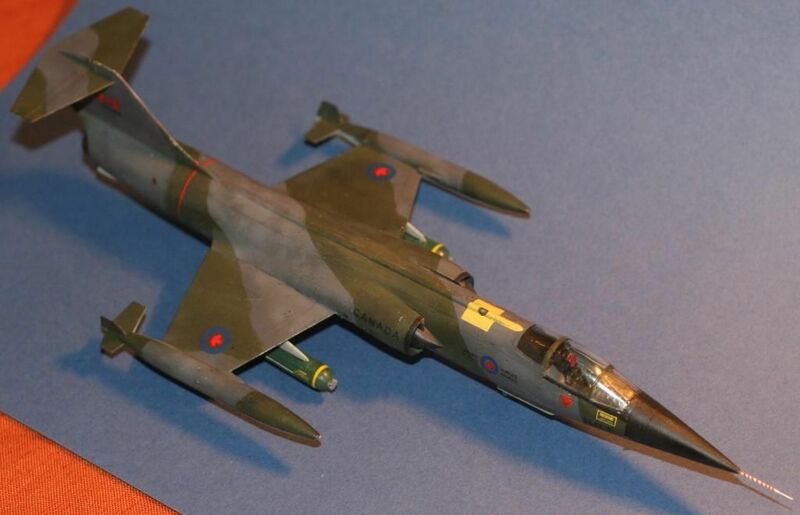 It was assigned at different times to AETE and 417 squadron. 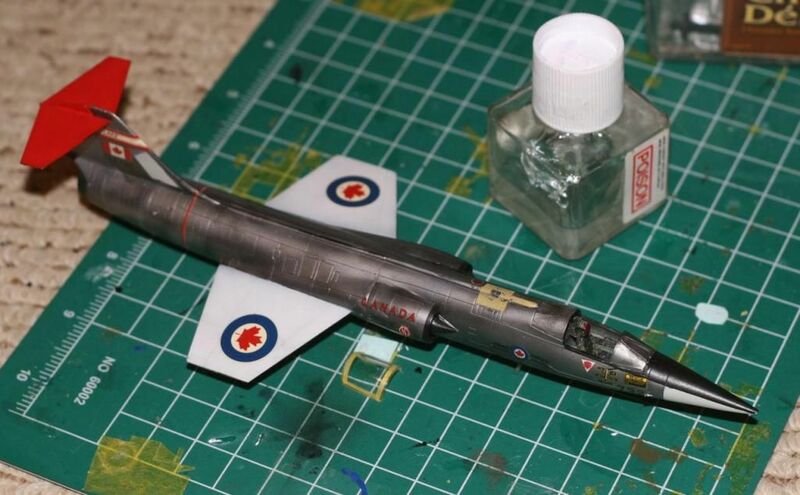 Here's a photo of 731 whiles assigned to 417 just before getting the variegated camo. Note that it is equipped with the rear RWR antennas. 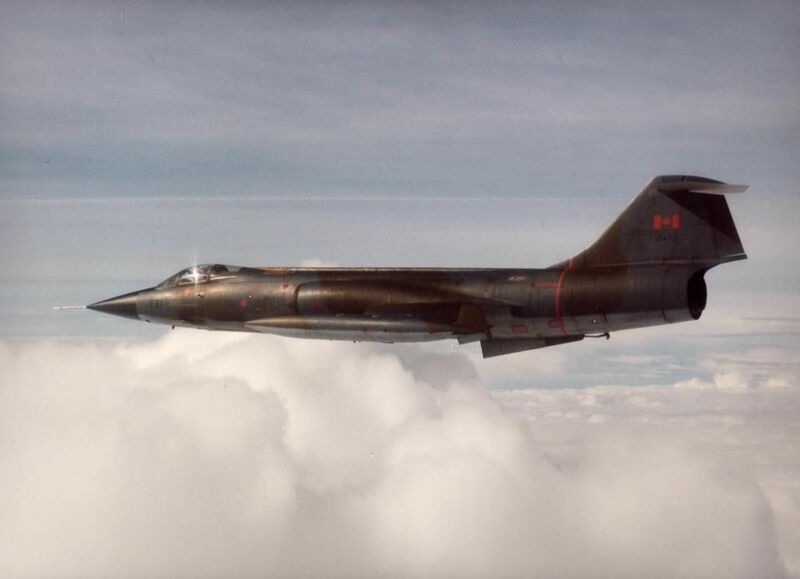 page 70 of Larry Milberry's Canada's Air Force Today has a pic of 104731 and it is captioned 'a 417 Starfighter' photographed at North Bay Sept. '81. It has a 417 crest for sure on it's intake(a low viz example). I think I've been given the wrong photo by my friend. I thought it was his from 441. Now its clear that it is not. I have another photo of his, with him in it and the 441 scheme. however its slightly off the nose, so its tough to make out the number conclusively, but it seems to be 883. Anybody have any thoughts? Was 883 in the squadron? Did plots get assigned long term to an aircraft, or did they use whatever was serviceable? 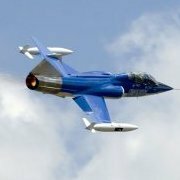 Baden squadrons got their A/C from the 1 AMS so they would serve a length of time, be rotated in for maintenance and be possibly assigned to another squadron (439, 421) after that. Pilots were not assigned particular airframes, Canada didn't have the luxury of ramps full of aircraft for that. 883 is quite a good possibility as the number, it served right up until retirement. 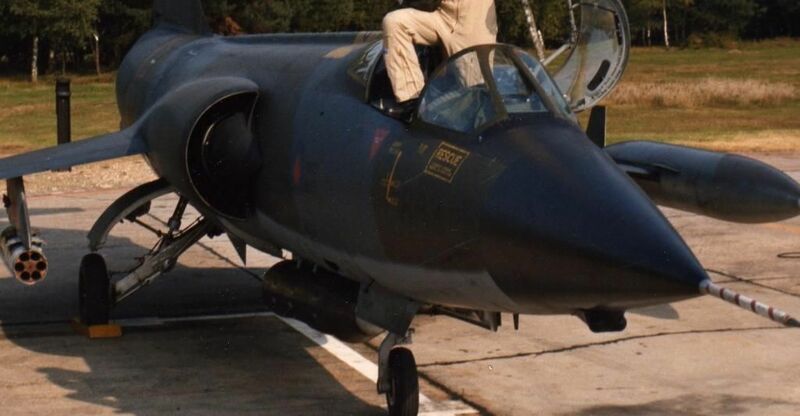 Couple more questions... would 441 104s have a squadron mark on them? 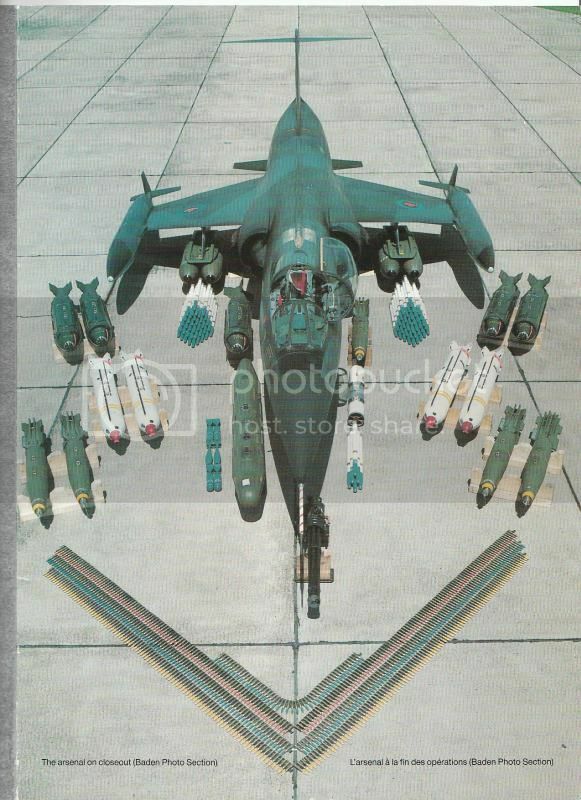 Also, I want to put BL755 cluster bombs on the model... was that at all regularly carried? Were there practice rounds? What sort of stripes were on them? OR would it be at all likely that they trained with a live round somewhere in Europe? Thanks again... this is frankly awesome. Very doubtful that there was any squadron marking on the 104s at that time. As to the armament questions, well that's not my area of expertise, sorry. Awesome Tony this is fantastic. Thank you. For armament, Neu, the most likely was the practice bomb dispenser on the centreline. They sometimes carried 4 cluster bombs (BL-755 or Mk 20), but rarely in flight. They often loaded these for exercises, as a force-generation exercise and proof they could do it within a certain time frame. A load with two underwing tanks and a centreline practice bomb dispenser was not uncommon either, or just empty wing pylons sometimes. The ones in Europe rarely dropped live weapons, but lots of practice weapons. Many European ranges did not allow live weapons. I remember my father telling me the first time he shot the "new" (at the time) CRV-7 rockets from the pods. They released them at the standard 3,000 to 4,000 feet slant range, and the motors were still burning when they hit. They made a huge impact at the range, and they got kicked off the range for having fired live warheads. They had to explain that they were dummy (depleted uranium) warheads, and eventually shot them from further out (about 6,000 feet slant range) so that the rockets were burnt out. I still don't know what I will do with the stores... which is a problem since I want to finish this tomorrow so I can send it express post. 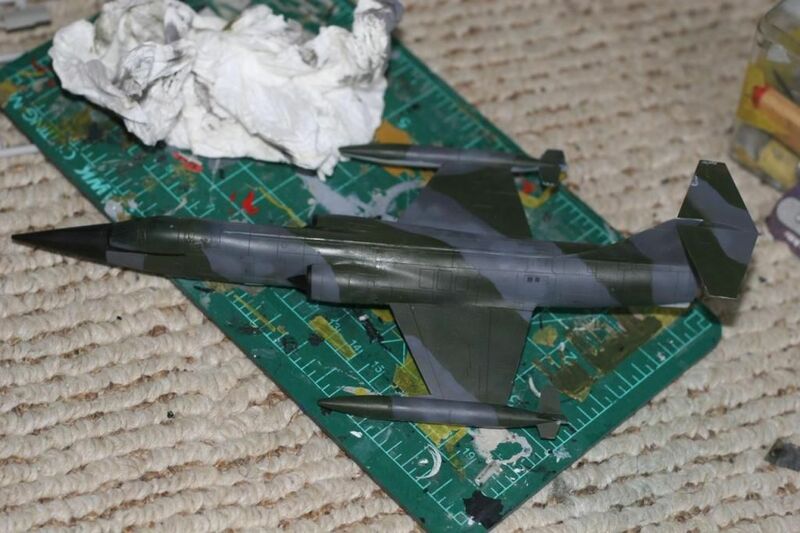 I've got the final gloss coat down, next its oil wash, then a final coat, with details added. After which I attached the Bombs. 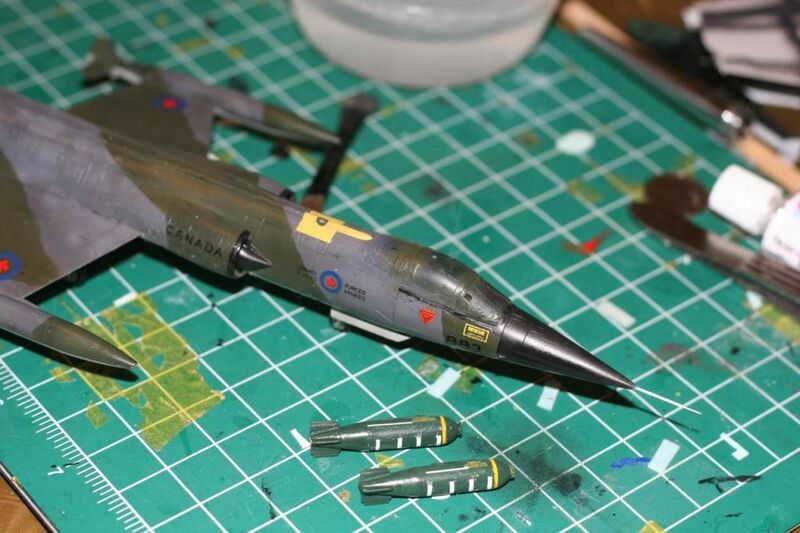 I''ll need to put the formation lights on and colour the tail detectors... and then I'll be done. Hopefully I will have a sunny day before I send it of to its actual pilot. I'm terrible with photos... I need to find a setup that works. Focus is kinda off on some of the photos too. Anyways. One of the big things is that I couldn't break the canopy to get the seat out to repaint it. So its not accurate, but its not too noticeable. Anyways... thank you all for helping me with this. I really really appreciate it. I'm going to send this on wed to its new owner. You're right about the seat - it doesn't show much at all with the canopy closed. Having the canopy closed is best also, for prevention of damage while shipping, and long-term as well. I like the variation in tones of the camouflage. The recipient will undoubtedly be happy!